This luxurious yet homely detached villa on a hillside in the capital's south-east, provides you a fantastic view of the Bay of Palma. The villa has five double bedrooms and an additional annex with two single beds and a bathroom – ideal for different family arrangements. The villa welcomes you with the charm of an unconventional, imaginative architecture with many balconies, staircases and quirky touches. Take advantage of the direct access from two bedrooms, for a morning dip in the refreshing swimming pool. 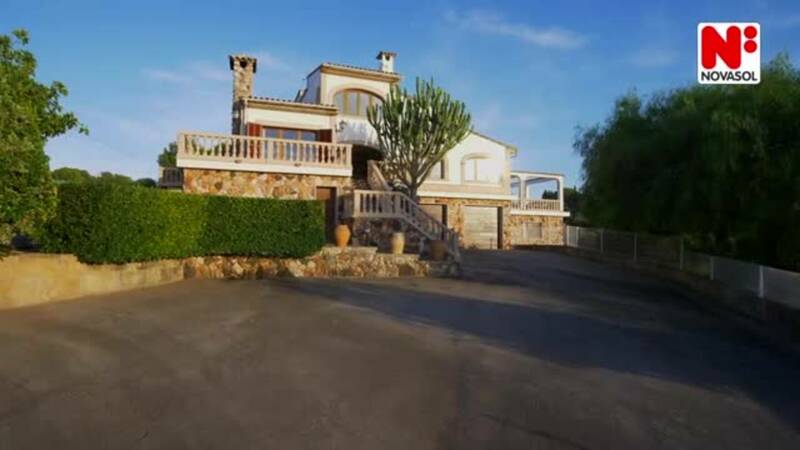 There is an open fireplace inside the house and a bright living room with dining area, which offers a wonderful panoramic view of the Playa de Palma, the airport, the city and the bay. The unique exterior of the terrace, where the pool is located close to the house is welcoming. Enjoy your evening privacy in a Jacuzzi and with a glass of wine or make yourself comfortable in the covered, relaxing area with stunning views. A barbecue completes the offer. Please note the Jacuzzi is unheated open from mid-June to mid-September and from 1st June until the end of September groups with guests less than 30 years of age are not allowed to book the property unless they are renting with family. Tourist tax and energy costs are included in the price. Several golf courses are located within a radius of 10 km and well known cycling trails are literally at the doorstep. There are two air conditioning units in the dining room. Energy costs are included. From 1st June till end September, groups with people under 30 years of age are not allowed. Only families permitted. Tourist tax included.